What humbly began as a family gum business in Brooklyn has evolved into a classic American sports company. Throughout its remarkable history, Topps has proudly fostered an enduring connection between fans and their heroes, not only in baseball but also in football, hockey, entertainment, and pop culture. Join us to hear about 75 years of creating products inspired by the sports, teams, and players you love. Topps takes aim at competitor Fleer’s Dubble Bubble with Bazooka, tagged as “The Atom Bubble Gum.” The chewy pink pads will be wrapped in jokey comics, starring eye patch-wearing Bazooka Joe and his motley crew, beginning in 1953. Topps will become a leading candy maker, famous too for Ring Pops, Push Pops and other confections. Topps stakes its first claim in American hobbyist culture with 252 Magic Photo Cards (images magically appear when blank 7/8" x 1 3/8" cards are moistened and exposed to light), which are actually freebies inside packs of gum. Featured among sports stars of the day are 19 baseball greats, including Babe Ruth, Rogers Hornsby and Cy Young. Fictional cowboy Hopalong Cassidy—popularized in books, radio, TV and movies—is the lone star of Topps’ first in a pantheon of popular culture card sets, giving kids cardboard collectibles of Elvis Presley, The Beatles, Mars Attacks!, Star Wars, Pokémon, Garbage Pail Kids and Desert Storm, as well as Wacky Packages and other sticker products. Topps becomes a permanent fixture in America’s most popular sport of the day by releasing its first series of baseball cards. The so-called Blue Backs and Red Backs, with 52 cards in separate sets, or decks, are designed to let kids play a game of card-baseball. Along with a photo and bio of a player, each 2” x 2 5/8” card has an at-bat result, such as “single,” “double,” “fly out” and so on. Although unique among subsequent Topps sets—and packed with taffy, not bubblegum—these historic cards establish the company as the leader in the upstart baseball card game. Topps creates its first annual set of baseball cards—and ushers in an everlasting love affair between the company and collectors. The set features 407 cards, each measuring 2 5/8” x 3 3/4”, and is released throughout the year in six series. Topps salesman turned executive Sy Berger designs the standard-setting cards—the first with team logos and simulated player autographs on the fronts and bios and stats on the backs—at his kitchen table in Brooklyn. Unlike today’s computer-aided designers, he uses a ruler and scissors to cut out pieces of cardboard to mock up prototypes. Kids clamor for wax packs containing six cards and a slab of bubblegum for a nickel. Along with Willie, The Duke and a slew of other future Hall of Famers, the superstar of the still-much-sought-after set is a young switch-hitter from Spavinaw, Oklahoma—Mickey Mantle. Kids everywhere start collecting and trading baseball cards—along with clothespinning doubles to bicycle wheels for that unmistakable flapping sound. Topps expands the hobby by introducing its first National Hockey League set, 60 cards highlighting players from the four U.S.-based teams, the Boston Bruins, Chicago Blackhawks, Detroit Red Wings and New York Rangers. The set—designed with All-American red, white, and blue colors—is anchored by Rangers defenseman Harry Howell (whose card #1, marred by rubber bands kids wrapped around sequential stacks, becomes rare), the Red Wings’ Alex “Fats” Delvecchio (#39, who eventually wins three Lady Byng Trophies) and his teammate and the game’s most popular player, Gordie “Mr. Hockey” Howe (his card #8 is the most highly valued of this seminal set). The first Topps All-Star Rookie team—rookies from the 1959 season—appears in the card series, designated with a gold trophy symbol of a batter on a top hat and the phrase “Selected by the youth of America.” In an interesting twist, Topps does not actually poll kids, but instead works with network of loyal retailers to pick the winners. The Sixties are rapidly becoming a decade of change in American culture—from long-haired hippies to moon-landing astronauts—and Topps leads the way within its popular niche. After its 1961 baseball cards welcomed the American League’s two new teams, the Angels and Senators, its ’62 set includes the National League’s expansion Mets and Colt .45s (Astros three years later). 1966 – Culture, and Topps, Goes Pop! Along with sports, America’s kids are glued to Sixties TV too. Topps is tuned into what kids love—not just athletes, but superheroes too—with a bevy of popular culture card sets celebrating small-screen hit shows such as Batman, The Green Hornet, Lost in Space, The Man from U.N.C.L.E. and Superman. Today those pop culture cards evoke baby boomers’ memories of their wonder years, which they’re all too happy to share with their kids and grandkids. Baseball is in the midst of monumental change in 1974, with the AL’s designated-hitter rule a year earlier and free agency a year later. Card collectors are becoming more savvy, too, valuing players’ rookie cards more than ever. Furthering that trend, Topps releases its first Traded series in late ’74, stacking it with rookies called up from the minors and players who changed teams during the season. By the late 1980s, the baseball card hobby is booming and Topps is at the forefront. At the same time, collectors’ interest in sports nostalgia and memorabilia is rampant, another trend Topps is nurturing. The company had shelved the Bowman brand after purchasing its early rival in 1956, then in ’89 releases a set of Bowman baseball cards. While harking back to the 1953 Bowman design—right down to the larger 2 ½” x 3 ¾” size and up-close player photos—innovative stats on the back make the set a modern-day hit. 1990 – Read All About It! 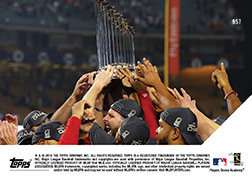 Topps launches Topps Magazine, a fan-friendly quarterly that profiles superstars, tracks up-and-coming minor leaguers and red-hot rookies and generally celebrates the booming card-collecting hobby. Top sportswriters sit down with perennial All-Stars, from Ken Griffey to Nolan Ryan. Readers look back at Topps’ greatest hits, sneak peeks at new cards, enter dozens of contests to win valuable prizes and welcome expert advice on building their collections. Even though Topps is synonymous with bubblegum cards printed on gray cardboard and sold in wax packs, the company has never rested on its laurels. Collectors have long complained that the gum and wax stains cards, detracting from their value. So Topps moves beyond all three traditions, dispensing altogether with the ubiquitous pink chew, switching to white card stock and sealing cards in plastic wrappers. Keeping its finger on the pulse of the marketplace, Topps makes other advancements in the early ’90s, such as the premium Stadium Club (1991) and super-premium Topps Finest (1993) brands. Topps celebrates the new millennium by leading collectors in two 21st-century directions. In the regular baseball set, they randomly insert 10 relic cards featuring not only photos of star players but also actual tiny pieces (mostly bases) of their home stadiums. Inspired by the burgeoning online and investing worlds, multi-sport eTopps cards are offered as IPOs (Initial Player Offerings) on a members-only website. Investors track market prices that rise and fall based on the player’s real-time performance, and buyers and sellers of cards negotiate online via eBay. Topps pushes the digital envelope by unleashing a trio of smartphone apps for its baseball and football devotees. Topps Pennant is for stats freaks, capturing the play-by-play and box scores from over 117,000 MLB games, from last night’s results back to 1952. Topps HUDDLE and Topps BUNT lay down an interactive, fan vs. fan game that marries the science of fantasy sports with the art of card collecting, bringing the thrill of chasing your sports heroes to your iPhone, iPod touch, and iPad. 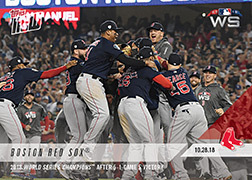 Utilizing on-demand printing technology, Topps introduces a daily trading card product that captures the greatest moments from sports and pop culture... as they happen. Topps pairs the beloved 1953 Topps Baseball design with the incredible hand drawn artwork of artist Mayumi Seto to create one of the industries most exciting products in recent years. What is a “Living Set”? It’s a trading card set that starts with Card #1, but does not have a final card. It’s not tied to any specific season or era... but lives on year after year. It’s the first cross-generational product that can be collected and traded for years to come.